Written for students in their final year of primary school. Over an hour of videos, including demonstrations by hip hop dancers, beatboxers, an Indigenous gumleaf & didgeridu player, technique work on tuned percussion, body percussion examples, dance steps, choreography and sound exploration. Bonus access to web extras: extensive background information and material, as well as useful links for the various musical styles covered + additional scores + worked solutions for puzzles & games! 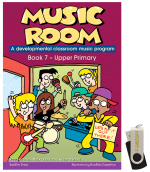 Music Room Book 7 +USB provides the full program in a physical book, with all audio visual included on a USB. Here is a copy of the contents page for Music Room 7. To see what a lesson looks like, access the free lessons available under the Product Samples menu.